Want to be notified of new releases in rcalme/svg-to-stl? 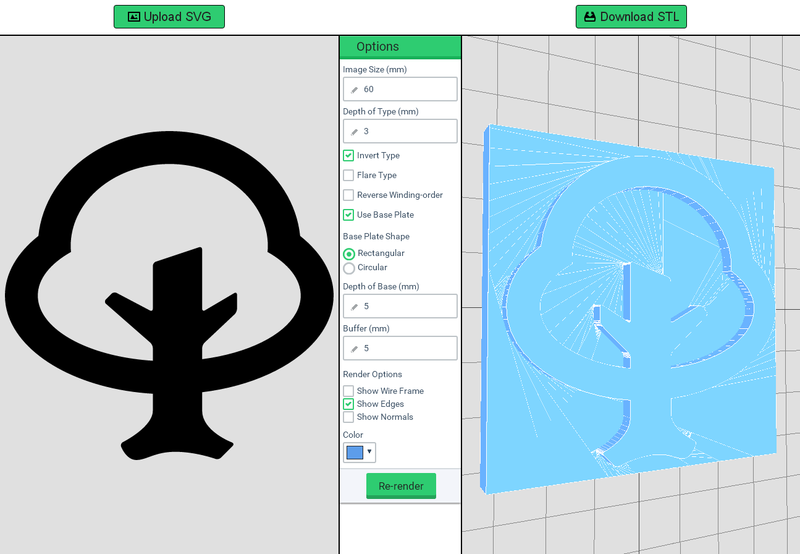 Created to enable the 3D printing of plates for a printing press from a 2D vector graphic, this tool runs entirely in the local browser. As the name implies, it takes a scalable vector graphics (SVG) file as input, and produces an ASCII stereo-lithography (STL) file as output. You can try the tool hosted directly from github. There are example SVG files in example-svg/Entypo. A hole in an SVG path should be defined by points in counter-clockwise order, where the shape outline is defined by points in a clockwise order, or vice versa. Some SVG creation tools don't do this correctly, and shapes render in 3D space as "inside out". You can try the "Reverse Winding Order" option to fix this, but it's possible to have both combinations of winding in the same file, ensuring that some part is always inside out. A hole that is not a hole, but an additional shape filled with background color will not render as a hole. SVG text elements are not supported. To render text, you need to convert the text to "outlines" or "paths" before saving the SVG file. SVG paths that include scientific notation cause d3-threeD to loop infinitely. Saving as "Optimized SVG" in Inkscape ensures that this format is not used.